Celebrating Over 25 Years of Excellence! 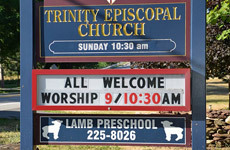 We are happy to welcome your child to Lamb School of Trinity Episcopal Church in Greece, NY. We provide an educational program designed to develop a child’s intellectual, social, emotional, and spiritual growth. We hope it will be the best experience for your child in preparing for Kindergarten. 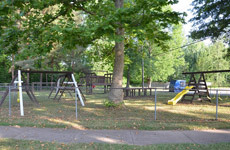 Trinity Lamb Preschool is a private not-for-profit school for children 3, 4 and 5 years of age. All sessions have limited enrollment and are staffed by a certified teacher and experienced co-teachers. Class size limited to 20 children with three teachers. Children should be three by December 1st of the school year. Complete toilet training is not required. We emphasize social development, taking turns, and getting along with others. Art and nature projects, music, movement, and stories are a regular part of each day. Each child brings his or her own nutritious snack and drink. Field trips are planned along with other special activities. Home visits are scheduled during the summer to ease transition to school. Class size limited to 22 children with two teachers. Children should be four by December 1st of the school year. 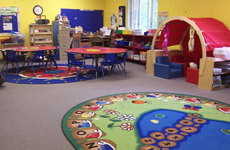 We emphasis Kindergarten readiness skills developed through play and circle time activities. Art, nature, science themes, jobs, stories, movement and music are a regular part of the curriculum. Field trips and many special programs are planned throughout the year. Each child brings his or her own nutritious snack and drink. Parents must complete a registration form and pay a registration fee to hold your child’s place in class. We can e-mail or mail you the registration and health form to fill out. Just e-mail us at trinitylamb [at] gmail [dot] com or call (585) 225-8026 with your questions or to request a registration form. There is a non-refundable registration fee of $100.00. The registration form and fee is due immediately to hold your child’s place. The health form is due in September. How are parents informed of class activities and events? Each month parents will receive a printed calendar and newsletter letting you know about class activities and dates of future programs. We will let you know as far in advance as possible of any field trips or special programs in which parent participation is necessary. The Three-Year-Old Class has no more than 20 children with 3 teachers. Often the class is smaller with 16 children. The Pre-k class has no more than 22 children with 2 teachers. We do not require children to be completely toilet trained at Lamb School. We know that every child is different and some take longer to completely train. If your child is in pull-ups, that is fine. Yes, field trips are an important part of our curriculum. The Three-Year-Old class goes to the Seneca Park Zoo, Cobblecreek Farm, Springdale Farm and sometimes The Strong Museum of Play. The Pre-K class visits the Seneca Park Zoo, Cobblecreek Farm, Rochester Museum and Science Center, including the Strasenburg Planetarium, and the Greece Ridge Fire Department. This class also has a visit from the Rochester Museum and Science Center at school to participate in a dinosaur program in January. Do children participate in special programs at school? The Pre-K class participates in a Christmas Nativity play and singing program in the church at Christmas time. Parents and other family members attend this program in the church during class time. After the program, families join together in another area for refreshments and a children’s gift exchange. This class will also participate in a non-competitive Olympics in March. Children will work on developing large motor skills and will receive a medal. At the end of the year children learn some special songs to sing for their parents at the end of year Graduation Program. Younger children in the Three-Year-Old class will not have programs. They will learn Christmas songs for the class Christmas party in December. There are many factors, academic, social, and emotional, which will determine if your child is ready for Kindergarten. We will be holding parent-teacher conferences in January and February to discuss any issues you may have with your child. Parents receive a full written report on the progress of each child. Teachers will meet with parents at any time during the year if needed. At Lamb School we have an open door policy for parents. Parents are always welcome, but it is not necessary to volunteer. We want parents to know that this is your school, as well as your child’s. Halloween is celebrated with songs and stories in class, but with a very light touch. On an evening in October, families are invited to a Halloween Party with food and entertainment. Children may wear costumes or not depending on their wishes. Christmas is celebrated at Lamb School with songs and stories about the season ending with a class Christmas party to which each family is invited. The Christmas Parties are during class time. Lamb School is non-denominational. All faiths are welcome. Yes, Lamb School has a large Parish Hall area which children use on a daily basis. We feel that physical exercise is extremely important in a child’s development. The Olympics ( Pre-K class ) in the spring emphasizes the importance of exercise in a fun way. Yes, at Lamb School there is a large fenced playground with swings, slides, climbing ropes, and a balance beam. How long has Trinity Lamb Preschool been in Greece? Lamb School celebrated its 25th year in 2008 with the original teachers who started the school. 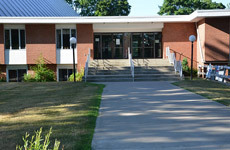 Each class is 2 1/2 hours from 9:30 am until 12 pm. The Three-Year-Old class begins on the rug for circle-time which includes music, singing, playing instruments and moving to music. The Pre-K class begins the day at circle-time also, but activities have an academic focus. The children have “jobs” like flag holder, calendar person, egg counter, and others, which introduce each learning experience. The children learn The Pledge of Allegiance, months of the year, days of the week, beginning addition and subtraction, and letter recognition during circle-time activities. They also have more in-depth science experiences. 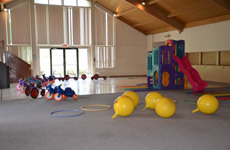 After circle-time the children will have free play time in which they can choose from many materials, such as blocks, puzzles, coloring, playdough, art and many other activities. Afterwards the classroom is picked up by the children and we get ready for snack. The children bring their own snacks and drinks. We try to encourage a nutricious snack. After snack, the class goes to the gym. 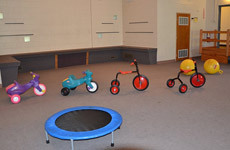 Each week many different activites are put out in the gym such as bikes, hoola hoops, balls, and balance beam. If the weather is nice, the class will go to the playground and take a walk nearby to see the ducks and geese. After gym-time we return to the main room for a story, flannel board counting, special songs and more. The day ends with children saying the “Goodbye Song” and waiting to hear their names. What will the children be learning in preschool? Our goal at Trinity Lamb Preschool is to prepare children for Kindergarten and beyond by teaching them readiness skills in a creative, fun way. We want them to develop a strong love for learning and for asking questions. We want them to be excited about new topics. Our hope is that each child will develop the confidence and self-esteem necessary to become the best student he can be. As well as, colors and shapes, letter and number recognition, counting, and cutting skills, the children will be learning about many areas of science. Our monthly themes are very important for choosing stories, learning new vocabulary and science facts, doing art projects, and for many field trips. A few of the themes in the Pre-K class are: Rain Forest Animals, Planets, Dinosaurs and Under the Sea Animals. In the Three-Year-Old class we focus on exciting authors like Eric Carle, Dr. Seuss, Audrey and Don Wood and many more. In the spring the children get to watch chicks and ducks grow in their eggs and hatch in the room. They experience caterpillars spinning their chrysalides and emerging as butterflies. The teachers at Lamb School have over 25 years of experience with preschoolers and believe that an appropriately paced day with both active and quiet activities contribute greatly to acceptable behavior. We have an emphasis on respect for others and the use of phrases such as, “Can I please have it when you are done?”, to help give children the tools necessary to get along in a classroom. If needed, a child will be redirected to another activity or have a quiet discussion of appropriate behavior. We stress with all the children a need for safety, respect, and working together to make the learning environment a happy, fun place. What if my child cries when school starts? It is not uncommon for a child to cry when a parent leaves. Even children who have attended school for a year sometimes cry. It is difficult to leave your crying child, but it is best to say goodbye in a casual way letting your child know you will be back soon. If you linger or stay talking to parents in the hall when your child is upset it is worse for your child because they won’t relax and settle in until they know parents are gone. The teachers will call you to let you know that your child is doing fine and having fun. Lots of hugs and support will be given to each child. We will take good care of them! The teachers at Trinity Lamb Preschool have many years of experience as preschool teachers with a background in elementary and early childhood education.